Pricing Promise: Our Pricing is Transparent & Extremely Competitive. All Pricing is based on our standard pricing chart providing consistent value to you on every job. Experience: We frequently coordinate & complete, large-scale commercial removals, for numerous National Companies. From Scheduled Apartment/Condo Bulk-Item Removal to Warehouse & Office Cleanouts, we have the experience to manage & fulfill every situation. On-Time Service & Safety: We guarantee arrival within your chosen two-hour window and always come prepared to remove the materials right away. The Junk Shot Team Professionals, are properly equipped and trained to perform every job in a safe and timely manner. We Recycle: At Junk Shot, we are passionate about the environment. We seek to Recycle up to 80% of Collected Materials. Our aggressive recycling practices, allows us to offer you Better Pricing, through Go Green Savings! 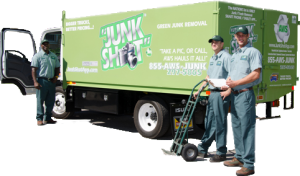 Licensed and Insured: Junk Shot / AWS is a fully licensed & insured Waste Hauler & Recycler. Simple Billing: We Offer Flexible Billing Terms to our trusted Commercial Clients. Our simplified billing procedure guarantees accurate and timely management of all work performed, along with the ease of Net 30-Day Invoicing.